Looks like CAD/JPY ain’t looking back from its climb anytime soon! I’ve decided to hop in on a move higher, following more OPEC updates supporting an output deal. In case you’re wondering what I’m talking about, make sure you look at my initial CAD/JPY long trade idea first. I was hoping to catch a slightly better price with channel breakout, but it looks like the pair is really banking on an OPEC output deal later this month. Based on the latest set of updates, Iraq has expressed willingness to cooperate in a production cut since higher oil prices would likely shore up revenues even with lower volumes. Because of that, the oil-related Loonie shrugged off weaker than expected Canadian retail sales data released earlier this week and broke past the 83.00 handle. Meanwhile, the Japanese yen remains the biggest loser of the bunch, as the low-yielding currency has been giving up ground due to risk-taking and expectations for more BOJ stimulus. Japan is set to print another batch of CPI readings before the end of this week, and downbeat results could push CAD/JPY higher. I was able to go long at 83.25 and I’ll be aiming for the 88.00 area, which appears to be the next long-term resistance. However, I’ll be rolling my stop up to entry once price tests the 84.50 level, which is around the pair’s average weekly movement. 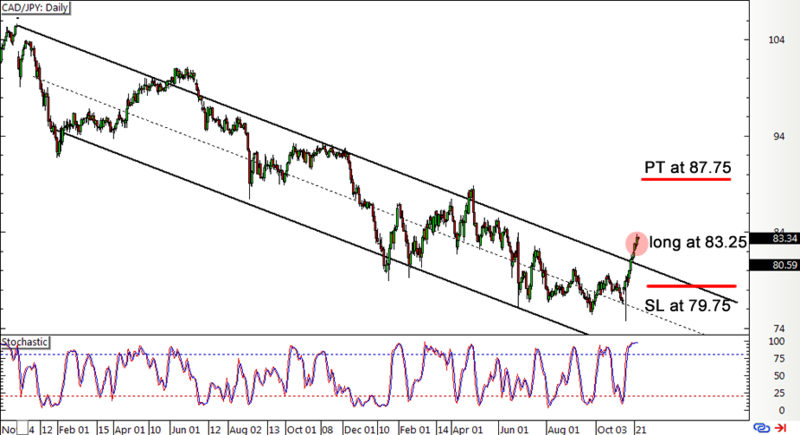 I’ve got my stop just below the 80.00 major psychological level and the broken channel resistance. I’ll also continue to keep close tabs on OPEC headlines, ready to exit early on strong indications that an agreement won’t be reached by the cartel in their November 30 meeting. Of course I’ll also be on the lookout for opportunities to add to my position on more reports suggesting that other nations, particularly Iran, are ready to cooperate. Long CAD/JPY at 83.25, stop loss at 79.75, profit target at 87.75 for a 1.28-to-1 R:R. I’ve risked 0.25% of my account on my first entry and I’ll be ready to add on a pullback or break higher.